For other uses, see Stations of the Cross (disambiguation). The 12th Station of the Cross – Jesus dies on the Cross. St. Raphael's Cathedral, Dubuque, Iowa. Stations of the Cross or the Way of the Cross, also known as Way of Sorrows or Via Crucis, refers to a series of images depicting Jesus Christ on the day of his crucifixion and accompanying prayers. 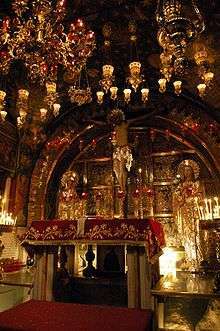 The stations grew out of imitations of Via Dolorosa in Jerusalem which is believed to the be the actual path Jesus walked to Mount Calvary. The object of the stations is to help the Christian faithful to make a spiritual pilgrimage through contemplation of the Passion of Christ. It has become one of the most popular devotions and the stations can be found in the churches of many Western Christian denominations, including Anglican, Catholic, Lutheran, Methodist and Western Orthodox parishes. Commonly, a series of 14 images will be arranged in numbered order along a path and the faithful travel from image to image, in order, stopping at each "station to say the selected prayers and reflections. This will be done individually or in a procession most commonly during Lent, especially on Good Friday, in a spirit of reparation for the sufferings and insults that Jesus endured during his passion. The style, form, and placement of the stations vary widely. The typical stations are small plaques with reliefs or paintings placed around a church nave. Modern minimalist stations can be simple crosses with a numeral in the centre. Occasionally the faithful might say the stations of the cross without there being any image, such as when the pope leads the stations of the cross around the Colosseum in Rome on Good Friday. The older stations can be an outdoor series of chapels in a landscape, known as a Calvary, and are sites of pilgrimage in their own right. 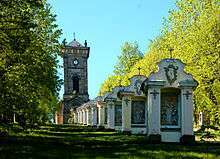 Examples include Sacro Monte Calvario in Italy, Kalwaria Zebrzydowska in Poland, Žemaičių Kalvarija in Lithuania. The Stations of the Cross originated in pilgrimages to Jerusalem and a desire to reproduce Via Dolorosa. Imitating holy places was not a new concept. For example, the religious complex of Santo Stefano in Bologna, Italy, replicated the Church of the Holy Sepulchre and other religious sites, including Mount of Olives and Valley of Josaphat. After the siege of 1187, Jerusalem fell to Muslims. Forty years later Franciscans were allowed back into the Holy Land. Their founder, Saint Francis of Assisi, held the Passion of Christ in special veneration and was the first person to receive stigmata. In 1217, St. Francis also founded the Custody of the Holy Land to guard and promote the devotion to holy places. Their efforts were recognized when Franciscans were officially proclaimed custodians of holy places by Pope Clement VI in 1342. Although several travelers who visited the Holy Land during the 12–14th centuries (e.g. Riccoldo da Monte di Croce, Burchard of Mount Sion, James of Verona), mention a "Via Sacra", i.e. a settled route that pilgrims followed, there is nothing in their accounts to identify this with the Way of the Cross, as we understand it. The earliest use of the word "stations", as applied to the accustomed halting-places in the Via Sacra at Jerusalem, occurs in the narrative of an English pilgrim, William Wey, who visited the Holy Land in the mid-15th century, and described pilgrims following the footsteps of Christ to the cross. In 1521, a book called Geystlich Strass (German: "spiritual road") was printed with illustrations of the stations in the Holy Land. During the 15th and 16th centuries the Franciscans began to build a series of outdoor shrines in Europe to duplicate their counterparts in the Holy Land. The number of stations varied between seven and thirty; seven was common. These were usually placed, often in small buildings, along the approach to a church, as in a set of 1490 by Adam Kraft, leading to the Johanneskirche in Nuremberg. A number of rural examples were established as attractions in their own right, usually on attractive wooded hills. These include the Sacro Monte di Domodossola (1657) and Sacro Monte di Belmonte (1712), and form part of the Sacri Monti of Piedmont and Lombardy World Heritage Site, together with other examples on different devotional themes. In these the sculptures are often approaching life-size and very elaborate. 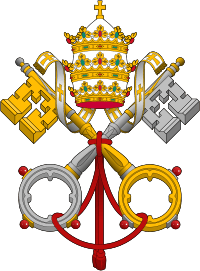 In 1686, in answer to their petition, Pope Innocent XI granted to the Franciscans the right to erect stations within their churches. In 1731, Pope Clement XII extended to all churches the right to have the stations, provided that a Franciscan father erected them, with the consent of the local bishop. At the same time the number was fixed at fourteen. In 1857, the bishops of England were allowed to erect the stations by themselves, without the intervention of a Franciscan priest, and in 1862 this right was extended to bishops throughout the church. The 15th station (Resurrection of Jesus) in the Saint Mary Rawaseneng Prayer Garden, in the Monastery of Saint Mary Rawaseneng complex, Temanggung, Indonesia. Although not traditionally part of the Stations, the Resurrection of Jesus is sometimes included as a fifteenth station. The Catholic Church in the Philippines also uses a third version of the Stations of the Cross. Approved by the Catholic Bishops' Conference of the Philippines – the country's episcopal hierarchy – this alternative set also closely follows scriptural accounts. Here, the Last Supper is designated as the First Station, the Denial by Peter is omitted, the Condemnation by Pilate is conflated with the Acceptance of the Cross, and the Resurrection is counted as the Fourteenth. The devotion may be conducted personally by the faithful, making their way from one station to another and saying the prayers, or by having an officiating celebrant move from cross to cross while the faithful make the responses. The stations themselves must consist of, at the very least, fourteen wooden crosses, pictures alone do not suffice, and they must be blessed by someone with the authority to erect stations. In the Roman Catholic Church, Pope John Paul II led an annual public prayer of the Stations of the Cross at the Roman Colosseum on Good Friday. Originally, the pope himself carried the cross from station to station, but in his last years when age and infirmity limited his strength, John Paul presided over the celebration from a stage on the Palatine Hill, while others carried the cross. Just days prior to his death in 2005, Pope John Paul II observed the Stations of the Cross from his private chapel. Each year a different person is invited to write the meditation texts for the Stations. Past composers of the Papal Stations include several non-Catholics. The pope himself wrote the texts for the Great Jubilee in 2000 and used the traditional Stations. The celebration of the Stations of the Cross is especially common on the Fridays of Lent, especially Good Friday. Community celebrations are usually accompanied by various songs and prayers. Particularly common as musical accompaniment is the Stabat Mater. At the end of each station the Adoramus Te is sometimes sung. 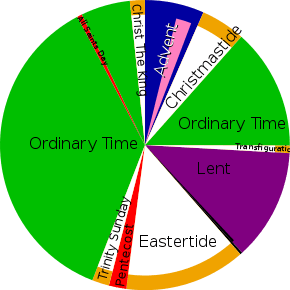 The Alleluia is also sung, except during Lent. Structurally, Mel Gibson's 2004 film, The Passion of the Christ, follows the Stations of the Cross. The fourteenth and last station, the Burial, is not prominently depicted (compared to the other thirteen) but it is implied since the last shot before credit titles is Jesus resurrected and about to leave the tomb. Some modern liturgists say the traditional Stations of the Cross are incomplete without a final scene depicting the empty tomb and/or the resurrection of Jesus, because Jesus' rising from the dead was an integral part of his salvific work on Earth. Advocates of the traditional form of the Stations ending with the body of Jesus being placed in the tomb say the Stations are intended as a meditation on the atoning death of Jesus, and not as a complete picture of his life, death, and resurrection. The Stations of the Resurrection (also known by the Latin name of Via Lucis, Way of Light) are used in some churches at Eastertide to meditate on the Resurrection and Ascension of Jesus Christ. Franz Liszt wrote a Via Crucis for choir, soloists and piano or organ or harmonium in 1879. In 1931, French organist Marcel Dupré improvised and transcribed musical meditations based on fourteen poems by Paul Claudel, one for each station. Peter Maxwell Davies's Vesalii Icones (1969), for male dancer, solo cello and instrumental ensemble, brings together the Stations of the Cross and a series of drawings from the anatomical treatise De humani corporis fabrica (1543) by the Belgian physician Andreas van Wesel (Vesalius). In Davies's sequence, the final 'station' represents the Resurrection, but of Antichrist, the composer's moral point being the need to distinguish what is false from what is real. David Bowie regarded his 1976 song, "Station to Station" as "very much concerned with the stations of the cross". Michael Valenti (known predominantly as a Broadway composer) wrote, with librettist Diane Seymour, an oratorio depicting the fourteen Stations of the Cross entitled "The Way". It was premiered in 1991. Stefano Vagnini's 2002 modular oratorio, Via Crucis, composition for organ, computer, choir, string orchestra and brass quartet, depicts the fourteen Stations of the Cross. As the Stations of the Cross are prayed during the season of Lent in Catholic churches, each station is traditionally followed by a verse of the Stabat Mater, composed in the 13th century by Franciscan Jacopane da Todi. These fourteen sites along the Via Dolorosa are where the events of the Stations of the Cross happened, according to tradition. These 14 stops form a route ending at the Church of the Holy Sepulcher that pilgrims have walked for centuries and are the inspiration for the stations of the cross in many churches today. Wikimedia Commons has media related to Stations of the Cross. ↑ "Stations of the Cross". Trinity UMC. 24 March 2013. Retrieved 17 April 2015. 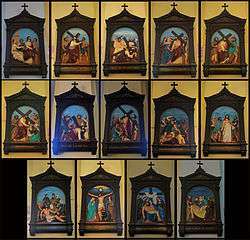 1 2 "Stations of the Cross". St. Michael's Episcopal Church. 2012. Retrieved 3 March 2015. ↑ Chryssides, George D.; Wilkins, Margaret Z. (11 September 2014). Christians in the Twenty-First Century. Taylor & Francis. p. 51. ISBN 978-1-317-54557-6. ↑ "Frommer's Events – Event Guide: Good Friday Procession in Rome (Palatine Hill, Italy)". Frommer's. Retrieved 8 April 2008. ↑ Ousterhout, Robert G. (1981). "The Church of Santo Stefano: A "Jerusalem" in Bologna". Gesta. 2 (20): 311. doi:10.2307/766940. ISSN 0016-920X. JSTOR 766940. 1 2 Weitzel Gibbons, Mary (1995). Giambologna: Narrator of the Catholic Reformation. University of California Press. pp. 72–73. ISBN 9780520082137. 1 2 Thurston, Herbert (1914). The Stations of the Cross: an account of their history and devotional purpose (PDF). London: Burns & Oates. pp. 20–21, 46. OCLC 843213. ↑ The Catholic Encyclopedia (1907). s.v. "The Way of the Cross". ↑ "The Official Web Site for the Archdiocese of Detroit" (PDF). Retrieved 2012-02-13. In some contemporary Stations of the Cross, a fifteenth station has been added to commemorate the Resurrection of the Lord. ↑ "Fr. William Saunders". Retrieved 2009-04-04. Because of the intrinsic relationship between the passion and death of our Lord with His resurrection, several of the devotional booklets now include a 15th station, which commemorates the Resurrection. ↑ "The New Way of the Cross". Visita Iglesia. Catholic Bishops Conference of the Philippines Media Office. Retrieved 13 February 2015. 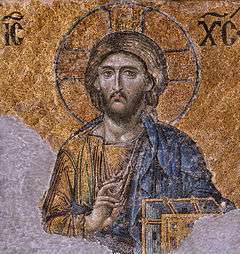 ↑ "CATHOLIC ENCYCLOPEDIA: Way of the Cross". Newadvent.org. 1912-10-01. Retrieved 2014-07-03. ↑ McBrien, Richard P.; Harold W. Attridge (1995). The HarperCollins encyclopedia of Catholicism. p. 1222. ISBN 978-0-06-065338-5. ↑ Composer's note in the published score (Boosey and Hawkes, B & H 20286). A list of recent Via Crucis used by The Vatican on Good Fridays from the Official Vatican website.